EMA describes the evolution of the way software vendors develop applications and the historical and present challenges they face in this latest report. The report looks at key concepts to support an Agile business and the foundational role enterprise management tools play in automating the “ideas to action” cycle. 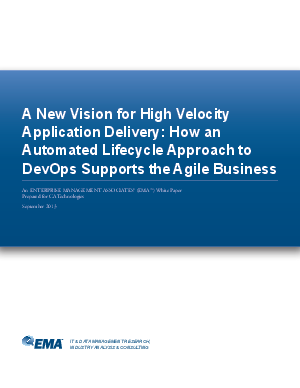 It approaches these topics from a lifecycle perspective, encompassing modern DevOps products and practices. Read how CA Technologies approaches developing a DevOps strategy that enables Agile application delivery through Service Virtualization, Release Automation, Data Mining and a key differentiator to a complete lifecycle approach, Application Performance Management.